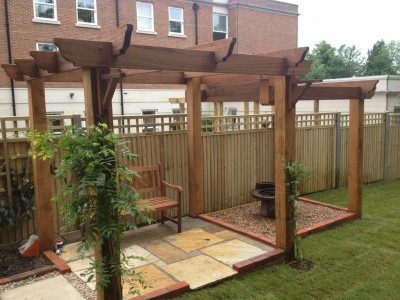 Are you looking to transform your garden with a unique look and bespoke decking Southampton? If you are, you should call Abbey Turf today on 02380 812 302. Let our team of professional landscapers in Southampton know how we can help you turn your garden into the highlight of your home. When it comes to creating an impressive garden, the best ones reflect aspects of the owners. They are an extension of the style and aesthetics of the home. Abbey Turf has extensive experience working with clients to give them results that match their tastes, not only matching expectations but exceeding them in every way. Our decking Southampton is perfect for hosting those ever important summer barbeques and social gatherings. They also make an ideal spot to enjoy the bouts of good weather in tranquil relaxation – after all, who doesn’t enjoy lounging in the sun with a cool drink? Our designers with work with you to ascertain your requirements, so that we can deliver a bespoke service and give you exceptional decking Southampton results. Our turf products that we supply, and can lay down as well, don’t use harmful netting. This ensures you’re getting a healthy, natural product which is integrated seamlessly with decking Southampton and the rest of your garden. It is also completely weed free, which means less maintenance. Another great option for creating a composite aesthetic in your garden is combining areas of our bark chips and mulch, which complement the installation of the decking Southampton in your garden. Like our turf, the bark can help prevent weed growth and keep your garden looking pristine for longer. Why Choose Our Decking Southampton? Abbey Turf is a privately owned, family-run business, which means we offer a personal touch and make sure our customers know they are getting something unique. For us, landscaping isn’t a chore or just a job, it’s a passion, and we take great pride in delivering the best results in the industry. Our landscapers in Southampton have over 25 years of experience to offer you in the pursuit of your perfect garden abode. All of the turf we use is produced at our own 180 acre site, where it’s grown naturally without netting to ensure superior quality. Like any piece of art, it’s hard to see the final picture until it’s complete. Everyone here tries to deliver results that excel past industry standards and client expectations, and we are always aiming to be the best at what we do. If you would like to see some of the results we have produced previously, why not take a look at our gallery? We are sure you’ll love what you see and contact us right away! Are you ready to get started? We are always ready, so contact us as soon as you can. There are several ways to do so, and perhaps the easiest of which is to pick up your telephone and call the team here at Abbey Turf on 02380 812 302. When you call us, you will be able to speak to one of our experts who can fill you in on any of our services. We can also get you booked in for a free site visit, survey and quotation based on your requirements. If you would prefer to contact our landscapes in Southampton using a written method of communication, you’ll be please to know our easily navigable website contains a quick and easy to use online form. All we need is your name, details of your preferred method of contact, and, of course, your enquiry about landscaping Southampton. Alternatively, you can always email us directly. We welcome any kind of contact, so feel free to use our direct email address to get in touch which is info@abbeyturf.co.uk. We monitor both the online form submissions and our email inbox all the time, so you can count on receiving a comprehensive reply within a reasonable time frame.